That's a lot of drumming — and all on Japanese DSes. Namco Bandai has announced that the Taiko no Tatsujin DS series has hit the million mark. 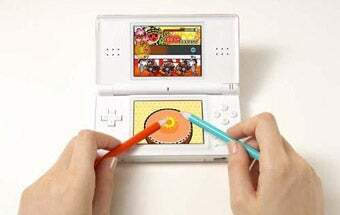 The franchise has two DS tiles: Taiko no Tatsujin DS: Touchi de Dokodon! and Taiko no Tatsujin: 7 Islands of Adventure. They went on sale July 24, 2007 and April 24, 2008 respectively. The two titles have now shipped a million copies in Japan. Originally an arcade title, the 14 home versions, excluding the recently released Taiko no Tatsujin Wii, have now shipped fourteen copies in Japan.